My first meditation class was a failure. I tanked it. Bombed it worse than anything since a college essay on The Canterbury Tales. Still, I strived for mindfulness. “Relax… and breathe,” said Mandy Vickerey, our instructor, as she coaxed us into releasing our worldly cares. Short and bubbly with a pink streak in her hair, Mandy spent nearly a half-hour of our first phone conversation enthusiastically reporting how she came to teach at the Dromtonpa Kadampa Buddhist Center just outside downtown Indianapolis. In class she downshifted her voice into a slow, cascading waterfall designed to throw the brakes on the world. It totally worked. I have high blood pressure, genetic anxiety conditions and the ability to drink many, many coffees every morning, so “relax and breathe” isn’t as easy for me as, say, “nervously tap your feet and obsess over your credit card balance.” But the voice helped. The goal, Mandy said, was to expel samsara, the idea that our souls are collectively trapped in an unending cycle of birth, life and death, and that our actions, good and bad, dictate the nature of our next reincarnation. You can break the cycle when you perceive nirvana, a state devoid of suffering and desire. I tumbled into meditation headlong, my eyes closed, each breath deliberate. Feet on the floor, spine straight but comfortable. Hands folded in my lap. Stillness. It feels odd to give yourself over to mental floating in a room full of shoeless strangers, but for 20 minutes, it clicked. But something kept going wrong. Samsara repeatedly reared its cackling goblin head. My thoughts would center on my pure, blissful core, and then, for no reason, I’d think about names of obscure characters in Star Wars. I’d resettle myself and find my focus, and I’d think of my dad, reminding me that I need new tires. Focus, distraction; focus, distraction. It was less a mental oasis and more a game of concentration. Before long, class was over, and mindfulness gave way to driving home. 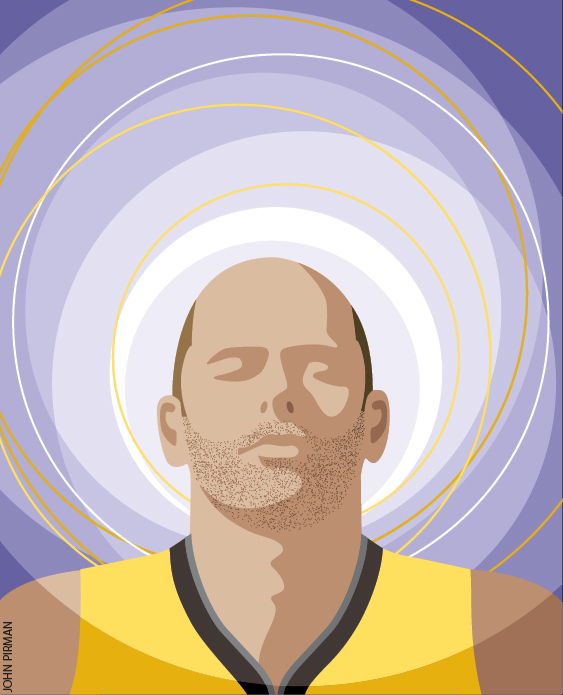 Fortunately, I’d learn, meditation is like shooting free throws. You can get better. But you’ll need to put in the hours. First off: You have a ton of samsara. You have project deadlines, lower back pain, cracked driveways and kids who won’t brush their teeth. You have electric bills, shedding dogs and narcissistic clients, and in the time left over, you probably want to lead a productive and fulfilling life. Samsara, more simply stated, equals stress, which is why my editors asked me to try meditation for a month to see if the process truly eased the burdens of daily living. I attended class with Mandy to get my (shoeless) feet wet, and then set about playing the meditation home game. I felt enthusiastic yet underequipped. (For instance, I had no supplies. I had a floor. “Do you have a mat?” a friend wondered. No, I had a floor.) But armed with an introductory CD and some topic cards from Mandy, I set about hitting my one-month deadline to achieve nirvana. Or at least, something nirvana-adjacent. Science fact: Stress relief is good, something everyone should probably do. And I discovered a curious second science fact: For something that basically involves extended sitting, meditation is a lot of work. To begin with, you have to find time for it. In their sterling 2011 book Willpower: Rediscovering the Greatest Human Strength, Roy F. Baumeister and John Tierney argue that habits are most effective when they’re subconscious, so I endeavored to put my meditation process on autopilot. I tried to make a habit of parking myself on the floor during the 2:30 p.m. break I traditionally reserved for coffee and empty calories. That ambitious plan was very difficult to stick with. I came up with excellent reasons to skip meditation. Most of them involved productivity: When it comes to crossing something off your to-do list or chilling on the floor for 20 minutes of enriching tranquility, your practical brain is unlikely to champion the option that’s best for your soul. Productivity will probably win out. So will reading a book to your kids or switching the laundry or Netflix. We, as a species, are pretty lousy at checking out. The world demands our presence and connectivity. It kept making unwelcome invasions into my early sessions, so I worried whether I was concentrating enough. And here’s another curious side effect of meditation: I felt I was disappointing that disembodied voice on the CD. There was no danger my mental evolution would change me, as a friend wondered, from a frenetic guy who talks too fast into a calm, assured vessel of gratitude who can bend spoons with his mind. After about two weeks, I developed a comfortable routine, better able to observe my thoughts rather than be pulled around by them. And I realized something about my brain: It’s a scattered, attention-deficit mess. Thoughts ping around like kids in a Chuck E. Cheese’s pizzeria. I also realized that “sitting quietly” is apparently some lost ancient art that I abandoned years ago, probably when I bought a smartphone. Mostly I realized that my entire day, and basically our entire culture, is designed to keep me occupied at all times. That I’m super-tuned to that level of frenetic movement, and that’s probably why I bombed my first meditation class. Those were the rough parts. But there were good ones, too, and by the close of my 30-day trial period, I was clear on a few key points. I knew that starting meditation was only the dawn of a process, and that my hope of achieving nirvana—or anything so ambitious—in a month was akin to buying new running shoes and expecting to be that “Born to Run” guy in four weeks. The goal is that there is no goal. The value is in the process. The benefit is focusing on the positive, on sweeping out (or at least ignoring) the clutter in your mind for a few golden minutes. But more than anything, I came to look forward to the dedicated break in my day, a time devoted to nothing but nothing. Honestly, I’d have found a way to blow that 20 minutes anyway, probably on social media or Hulu or one of the other attention-grabbing gremlins out there. Channeling 20 minutes toward meditation made me feel more accomplished at the end of the day, as if I’d achieved something more useful than mindless newsfeed scrolling with my idle minutes. Scrolling is not restorative, and it’s not quiet. And I desperately need restoration and quiet, and you probably do, too. That’s my main takeaway and the reason that meditation still has priority seating on my to-do list. Like many items on that list, I don’t always get to it. (I mean, that thing is often less a “to-do list” than a sad chronological catalog of unfinished tasks.) But the break is always in there. I’ve become much more mindful about finding that time, whether it’s an actual meditation break or a walk around the block or a lunch without my laptop. It’s a small but tangible lifestyle change, one that took a stronger hold than I’d have guessed. A break that’s an actual break. I sort of forgot those existed. Think about it: When was the last time you had silence, actual unbroken, uninterrupted silence? Take 20 minutes—or five—and count the distractions: emails, instant messages, phone calls, Facebook alerts, bank alerts, phone alerts, money worries, dinner plans, other stressors present and unspoken. It’s relentless, and I’m accustomed to it. I can’t claim that meditation drew me nearer to my spiritual self, but I’m still learning. What I do know is that I’m better at realizing when my focus-challenged brain is simply growing too overwhelmed, and when it’s necessary to step back, take a breath and reassess what’s really important. That in itself feels like a small step toward nirvana.